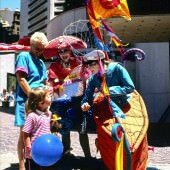 This slide show combines vox pops recorded during the Sydney Olympic Games in 2000 with photos from the City of Sydney Archives. It was produced by the City of Sydney’s History Team for the 10th anniversary of the Sydney Olympics in 2010. During the Sydney Olympics in September 2000 the centre of the city thronged with tourists, spectators, partygoers, performers and workers. The vox pops and images in this video were collected by City of Sydney staff during this festive Olympic period, mostly at the lives sites in the city which hosted entertainment, partying crowds and huge screens beaming in major events from Sydney Olympic Park. The video was produced by the City of Sydney’s History Team in 2010 for the 10th anniversary of the Sydney Olympics.